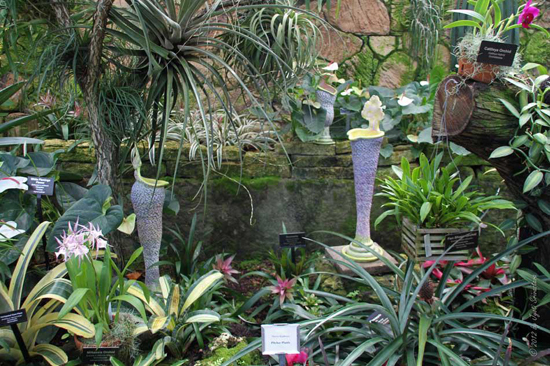 These three installations are located at the Lincoln Park Conservatory until November 2nd, 2012. 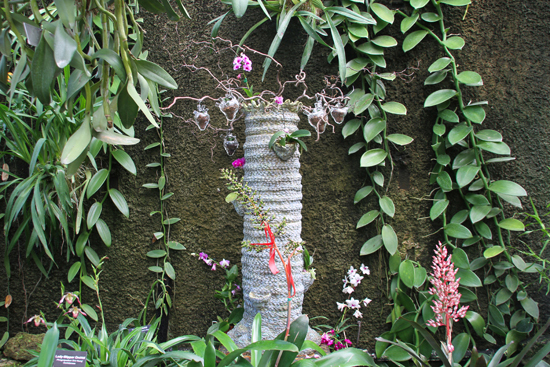 The Orchid Organ Tree speaks to the long history of human and plant relationships, the gnarly trunk is inspired by my love of cycads and the way my organic lump by bump building of sculptural forms mimic their lovely ancient dinosaur-time textures. 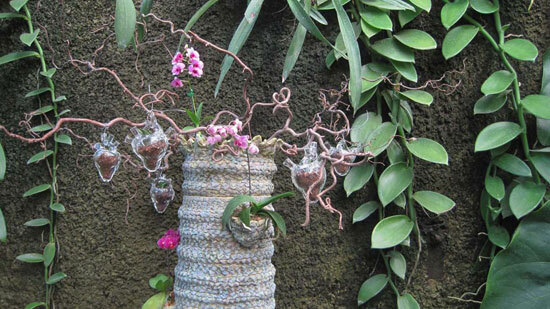 Fragile glass hearts propagate baby orchids and side growths sport young orchids. Cutting edge nuerocardiology research is finding that cells within the human heart are very similar to brain cells and these special heart cells are in constant communication with brain cells, so we are thinking with our hearts more than metaphorically and indeed, if we do listen to the wisdom of the heart we may find ourselves sustaining a more biodiverse and verdant planet. Pitcher Plants: Carnivora Sarracenia is a progression of my ever evolving investigation into the exuberant forms of botanical anatomy. 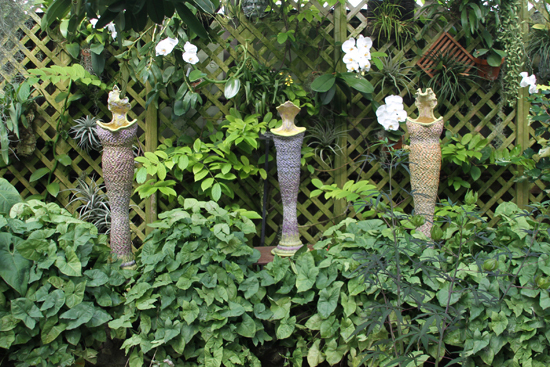 This Carnivora series is based on actual carnivorous plants and these sculptures give a nod to the tall, elegant North American species “Sarracenia”, that is threatened by urban development, drainage of wetlands, plus illegal and unsustainable harvesting. One whiff of their sweet scent brings forgetfulness of sorrows, at least to the insects who slip into the deadly chamber and are digested by a plant that evolved this survival technique to compensate for the nutrient poor acidic bog environment pitcher plants dwell in.